« Parking Lots, or Lots of Parks? Among the many things Austin has to offer is a vast number of design firms and really talented independent designers. It’s no secret that Austin is full of creatives, but let us delve into a little bit of what our great city has to offer. Zocalo Design and Advertising – Zocalo is one of my favorite firms in Austin. They create everything from web pages to packaging to identities for companies. Zocalo’s clients have included The Austin Film Festival, KLRU and and Uchi. My personal favorite is the environmental graphics they do for stores. Check them out at the the Zocalo website under environments. Ranch Road – Ranch Road is a creative solutions company based out of Austin. They boast a lengthy client list that includes companies from 3M to Howdy Honda to Sweet Leaf Tea. Ranch Road offers graphic design, digital printing, marketing solutions and personalized URL campaigns. They are a one stop shop for getting your business or company’s name out there. But mostly I enjoy the brilliant work their designers have done. Check out the Ranch Road portfolio here. Envision Creative Group – Lastly I have to mention Envision Creative Group. Handling everything from signage to logos to custom Powerpoint templates, Envision caters to clients like Amy’s Ice Cream and the Texas Culinary Academy. 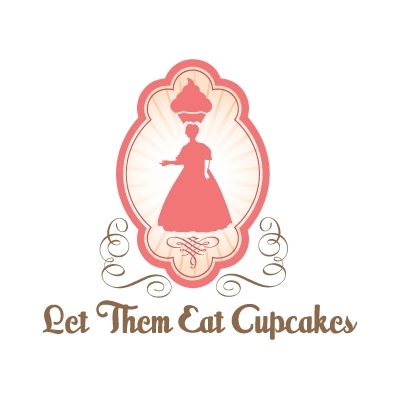 Here is a sample of a logo they did for Let Them Eat Cupcakes. I think this logo is beautiful and memorable – everything a logo should be! Basically Austin is a hotbed for super talented creatives. Their amazing work can be seen all over town, at the businesses I mentioned earlier and more. Next time you see a logo or sign or brochure you like, find out who designed it. You may want to check out the designers other work, and you never know when YOU may want to hire a design firm for yourself.